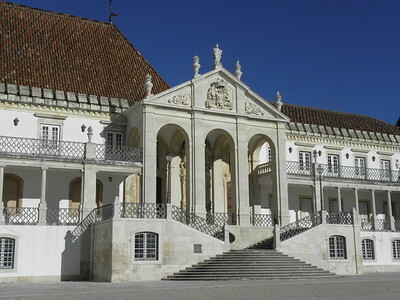 The University of Coimbra – Alta and Sofia has been an influential university from the medieval period til the modern times in the Portuguese world. 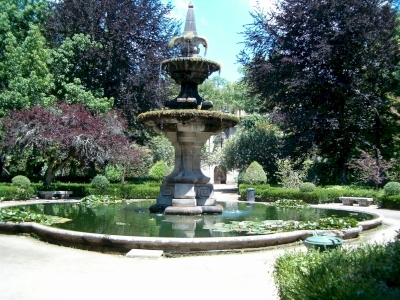 The University was moved from Lisbon to Coimbra in 1308. The site comprises two groups of buildings: one around Sofia Street in the lower part of the city, and one in the upper (Alta) part. Both hold a number of colleges, though the main University buildings are in Alta. ‘University City’created during the 1940s. 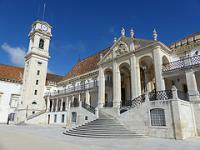 Coimbra University has succeeded in becoming a WHS in 2013. On a cold Sunday morning in December 2012 I visited the historic center of Coimbra, aiming to pro-actively tick off this one. The university buildings are located in a small core zone uphill, its old buildings being surrounded by several remarkable structures dating from the 20th century. The latter almost look communist. I had to wander around in the area for a while, as tickets (available at the new library) are sold only from 10 a.m. in winter, and the first entrance to the university buildings starts only at 10.40. The inner courtyard of what used to be a palace is certainly striking. Doors from here lead to the Joanine Library, the São Miguel Chapel and the Grand Examination Room. These are the major sights here, with their exuberantly baroque decoration. After all the anticipation and waiting I was a bit disappointed though: the rooms are not that big, 5-10 minutes in each and you have seen it all. I also do not like the fact that photography is forbidden inside - maybe it is done to keep the business of the local students going, who are selling photobooks in the courtyard. Despite my doubts last year, now we know that it has made it into the WH List. There still seems to be room for sites connected to science. 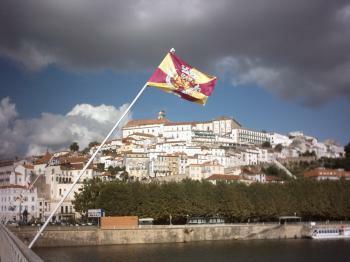 I spent a week in Coimbra in June 2008. The reason of my stay was a scientific conference organized by the University and it took place in the lecture halls of new parts of the University; new means from 20th century. Thus, I had great opportunity to explore and enjoy the site very intensively. The local organizers also did for us guided tours to older parts of the University such as library, and the Museum of science - Chemistry Laboratory. Besides, we visited botany garden (photo), the cathedral and other parts that are now included to WHS. I had great memories on my stay. I could not say that the individual monuments are unique (for example, I like modern campus of Sapienza University in Rome more than austere buildings in Coimbra, and the cathedral is a small sister to Santiago de Compostela church), but the entire ensamble together vith the "spirit" of the University makes the Coimbra special and worth inscription. Coimbra is a city in two parts. Indeed, the upper section was a city unto itself. One of the aristocracy and clergy, while the lower section was inhabited by merchants, artisans, and labourers. Therefore, it is not unexpected that some of the more refined or classic monuments reside in the upper section, but most of the fun is to be had in the lower section! My wife and I walked the entire boundary of the inscribed area (probably twice). While the university buildings are excellent, particularly the library, and some of the views are superb, many of my favorite places were slightly hidden or not obvious points of interest. These are the places I will discuss here, since they have not been mentioned yet. The garden, which includes exquisite terraces, a glass greenhouse, and monumental fountains was a perfect place for a walk. The garden really is pleasant and I found much more than I expected! These places really make exploring fun, when its far better than originally thought. I notice on wikipedia it states "The garden, considered one of the most beautiful of Europe, occupies 13 hectares and can be divided in two parts." While that judgement may be slight hyperbole, I found the garden far more interesting than the typical austere symmetrical gardens that blanket palace grounds throughout Europe. The garden is quite large, but it also feels secluded, a place for contemplation and relaxation. You could imagine students seeking out quite places in this garden. This fairly large aqueduct dates back to the 16th century. Its impressive to say the least, but less so if you just visited Segovia! Which I had. Still, it was interesting and I knew nothing about it beforehand, which made it another bit of fun exploring. Before anyone checks a map of the inscribed area, yes its included along with the garden. Since its location is adjacent to the garden, you can enjoy both easily. Formerly part of the Monastery of Santa Cruz, this cloister which is now a fusion of a cloister and garden, is stunning and a bit out of place all at once. The location is also somewhat near to a convenient elevator that some use to more easily reach the upper section of Coimbra. Besides the birds, we pretty much had the cloister to ourselves. The yellow color with the blue sky made an excellent object for photography. It will probably only take 10 minutes of your time, but its a worthy stop. A slight detour just off Sofia street, you might find some decent food here, but it also has some dark history. Very little remains, but through an arched door you can see some of the original foundations of the Inquisitional Court headquarters in Coimbra. Not much information, but nevertheless I found it interesting. Overall, Coimbra was one of my favorite places in Portugal. Besides the history, the food is delicious and there is some truly spectacular terraces in which to delight in both food, wine, and conversation. 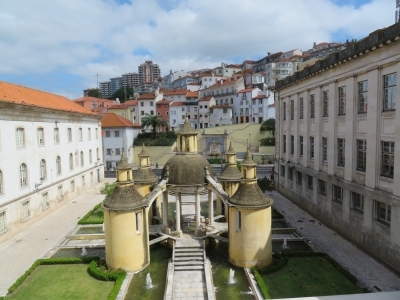 The University of Coimbra is the latest addition to the Portuguese World Heritage List and one of the few sites in the category secular education and science. The inscribed area comprises buildings from the 12th century (the old cathedral) to the 20th century. You have a nice view from the opposite bank of the Mondego river up to the hill with the main university buildings towering above the city. I entered the upper town (Alta) through the Arco de Almedina. The way up to the university buildings lead past the Sé Velha, that looks more like a castle than a cathedral. It is worth a visit, in particular the cloister. I was surprised to find such a quite large cloister between these steep and winding streets. However, after having visited Alcobaça and Batalha, I was not that impressed anymore by churches and cloisters. But if you make the trip in the opposite direction, you can take it as an introduction to the World Heritage monasteries in central Portugal. 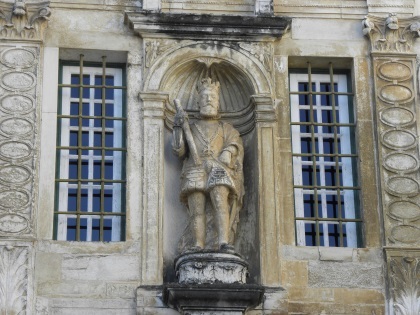 The main sight in Coimbra is the former Royal Palace of Alcaçova at the highest point of the city. The historic buildings are lined around the inner courtyard: Biblioteca Joanina, Capela de São Miguel, the bell tower Torre da Universidade, the Palace with the Sala Grande and a few other historical rooms. Tickets are available at the new library just across the street, and you have to book a time slot for the Joanine Library. The visit to the Biblioteca Joanina takes about 20 minutes, taking photos is not allowed (but in the other buildings). The library is a great example of Baroque architecture, but the other buildings are a bit underwhelming. I liked best the beautiful courtyard, the ensemble of buildings and the open south side with a great view over the Rio Mondego. And do not miss the seal of the University in front of the main gate, a fine example of Calçada Portuguesa (Portuguese pavement). Next to the historic buildings are the most recent buildings in the core zone: several faculties built in the 1940s, the period of the "Estado Novo" dictatorship. The photo shows the two architectural styles, seen from the Baroque bell-tower of the Alcaçova Palace. Actually, the best part of the visit was to stroll through the streets of the university city and explore the buildings that are still in use today. Most of the Colleges were open, at least the courtyard, the corridors and the cafeteria were accessible. Examples are the College of S. Jeronimo and the Royal College of Arts with a nice courtyard (both at Alta), the College of S. Agostinho (halfway down to Sofia), and the College de Carmo (at Sofia). I would recommend visiting Coimbra on a weekday and not during semester break, to get also a glimpse of the university life. Coimbra is also known for its special style of Fado, which is different from the Lisbon version, less sad but more lyrical and romantic. The Fado de Coimbra is sung only by men because it is a student tradition that originated at a time when only men were admitted to the university. Though I spent only one evening in Coimbra, I attended two Fado concerts. First, at the Fado ao Centro, which at first glance looks like a tourist trap, but actually it is a cultural center to promote Fado. They also explained the history and tradition of the music, I can highly recommend the show. And later in the evening, rather by chance, I had a second concert at the Café Santa Cruz, a nice traditional coffee bar next to the Santa Cruz monastery. The historic ensemble of the Royal Palace alone would not justify inscription on the WH list in my opinion. 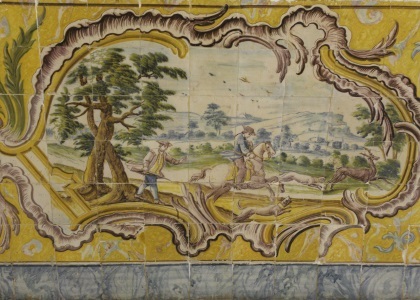 But Coimbra is an example of a university city, testimony of the interaction of a university and a city over seven centuries. However, as a university city it can not compete with Oxford and Cambridge. I spent two days in Oxford in the previous year (in May 2017) and I visited Cambridge 15 years ago, both are great sites. And so I left Coimbra with exactly the same question that I asked myself at Oxford: why the hell is this (Oxford) not a World Heritage Site? Coimbra has been long on my list to visit especially because of the library. Oh was it worth it. I was actually really surprised and I'm not quickly surprised anymore. The St. Michaels Chapel is also a piece of art and I was lucky to see some kind of celebration there. Not sure what it was actually. The Santa Cruz Monastery was also very nice but at first i didn't realize there was a door to the cloister behind it. A bit hidden. Of course: everywhere tiles! They are beautiful. I visited when I drove from Porto to Lisbon. It's easily visited, a long day but it's easy to do. From Porto it makes a nice day trip too, from Lisbon it's a bit far away maybe. Many photos on the link below! I visited this WHS in August 2014. I spent 2 nights here and I really had a good time. Visiting the university costs 9 euros + 1 euro to climb the clock tower. The Joanine Library and the nearby chapel of St Michael alone are well worth the money. While in Coimbra I had the opportunity of experiencing the Coimbra Fado which is considered to be an intangible heritage by UNESCO. I have fond memories of the day I spent in Coimbra 10 years ago. The atmosphere, weather and pleasant surroundings made me seriously consider moving there to study for my master's degree. Alas I didn't go there but the spirit of this quintessential European University City did stay with me. Friends and acquaintances that I have met who were lucky enough to learn here have certainly reinforced my initial desire to stay for longer. I remember really enjoying the walk across the river and the winding spirals of streets that led me up to the main university compound. I only had a quick glance into the library as I think there was some kind of event going on inside. I really enjoyed sitting in the shade in Parque de Santa Cruz watching some wonderful azulejos adorned fountains and admiring the graffiti laden bars of various university organisations. 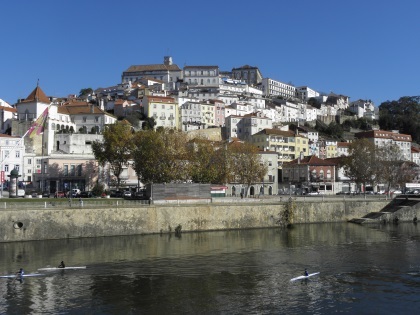 Coimbra was a lovely little escape and I remember my journey there being a bit of a turning point for me personally. So it was with great fondness that I look back, and give it a strong recommendation, I may not have ended up studying there but it certainly seems to be a very enjoyable place to learn. If you are heading between Porto and Lisbon it really is a great place to peel away at the half way point and experience a true university town. 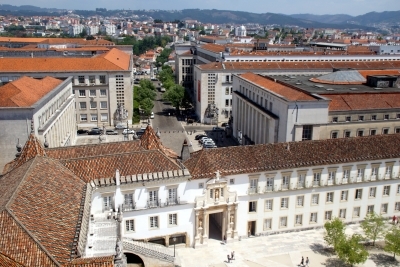 First sites filling gaps cited by ICOMOS: Education (2013) - "The University of Coimbra-Alta and Sofia influences educational institutions of the former Portuguese empire over seven centuries received and disseminated knowledge in the fields of arts, sciences, law, architecture, town planning and landscape design. Coimbra University played a decisive role in the development of institutional and architectural design of universities in the Lusophone world and can be seen as a reference site in this context."